We finally have gotten our first snow of the year here in Connecticut! It seemed like we had a very warm fall this year. 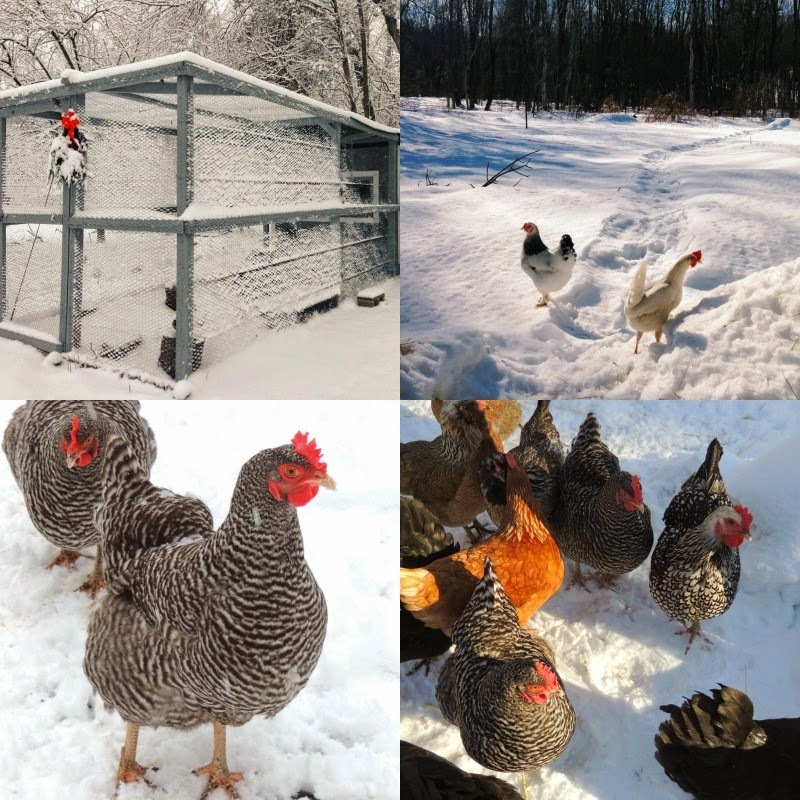 Our chickens do not seem to mind the snow, although I've heard from many other people that their chickens refuse to come out of the coop or refuse to walk in the snow. 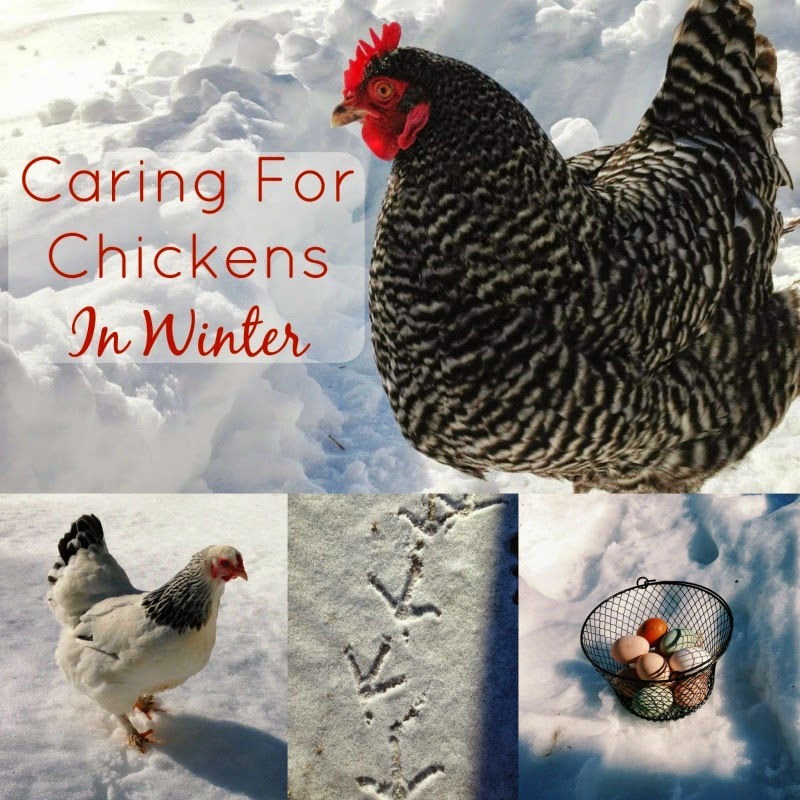 Many people worry about caring for the chickens in the winter, but it's simpler than you think! 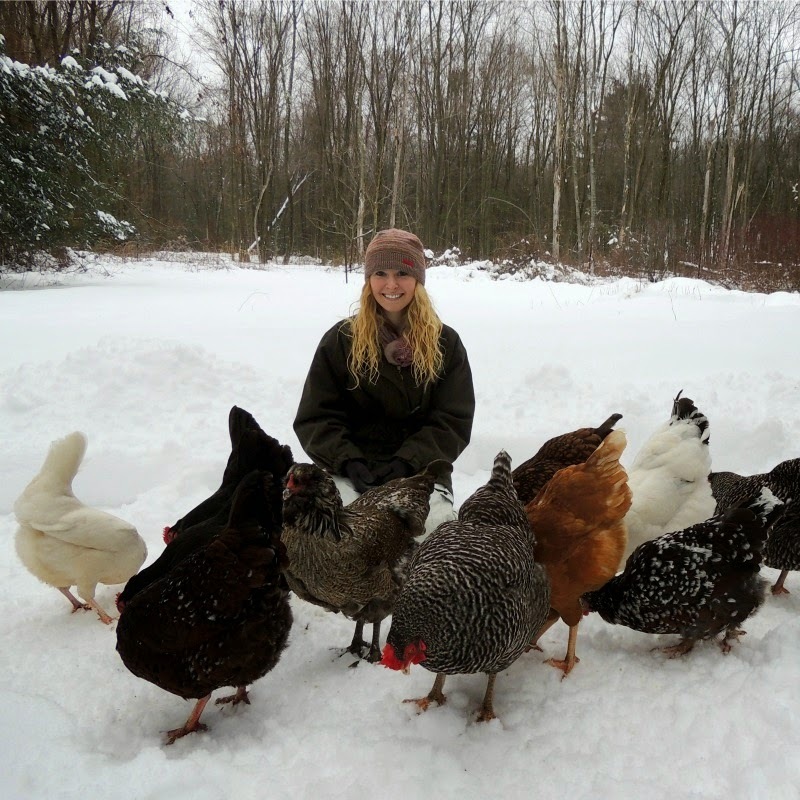 A lot of people worry about their chickens when the temperature drops, so I thought I'd share my winter tips with you. By far, the most important think to remember is that chickens are so much hardier than you think! They have the ability to adjust to their environment as the seasons change. People have been keeping chickens for a long, long time. Long before heat lamps, heated water bases, and insulated chicken coops. Our chickens have happily and safely been outside with no supplemental heat, to temperatures of -10 degrees Fahrenheit. That's pretty cold! Yet they were all active, happy, and even laying through the cold weather. Should You Heat Your Coop? The resounding answer is a big NO! Resist the temptation to add a heat lamp or heater to your coop. Firstly, your chickens do not need it. Second, adding a heater is so incredibly dangerous. There are hundreds of coop fires each year from using heaters and heat lamps. Thirdly, they are incredibly expensive to run. They are just not worth it. Picture this: it's the middle of winter, you're cuddled up on the couch in your PJs under a warm blanket. Suddenly, you appear outside in a foot of snow with no coat, no hat or gloves, in just your PJs. You'd freeze right? Because you are used to the warm temperature of your house. If you have a heater in your coop, you are creating the same situation for your chickens. They will get used to the warmer temperatures, and not acclimatize as the temperatures begin to drop. Once you add heat, you cannot take it away. If you have a power outage or your heater/heat lamp breaks in the middle of the night, your chickens will be in major trouble. The bottom line: Adding heat lamps and heaters are much more dangerous to your chickens than the cold will ever be. Chickens are simple creatures and they don't need much to be happy and comfortable. Using the deep litter method in your coop is the best way to keep it a cozy place for them. It will keep the temperature warmer, but not too warm! Once I measured a 15 degree difference between the outdoor temperature and the temperature in the coop, which is perfect for those really cold days. The deep litter method also gives your chickens something to scratch through when the ground outside is frozen. Tossing some scratch into the bedding is so much fun for them! If it's going to be extra cold, add a bale or two of straw to the coop. You can leave them whole. They chickens will love climbing on them and they will give the coop more insulation. Make sure to prevent any drafts in your coop. Nothing will make a chicken cold and miserable faster than a drafty coop. Their coop needs to be a place free from wind so they have an option to get out of the elements if they choose. We cover up the side windows in our coop (and leave the front windows open for ventilation) and this prevents any wind from whipping through the coop. Try sitting in your coop on a breezy day - you'll surely notice any drafts. 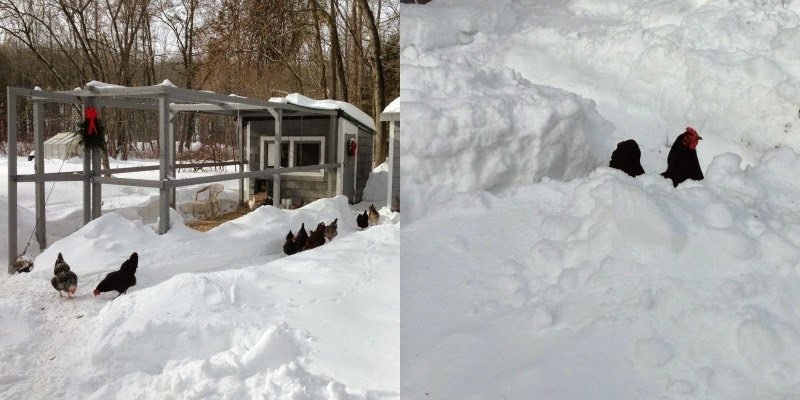 If you have more than a few inches of snow, your chickens will really appreciate it if you shovel some paths for them. It's no fun for them to fall through a big pile of snow! Especially, make sure that the areas around the feed & water are clear so they always have access to them. All animals need access to water. It's a simple fact that when the temperatures fall, water freezes. If you have access to electricity by your coop, your job is pretty easy. Using a heated water base or a heated water bowl will keep your water from freezing. Make sure to use electricity safely! We only use these bases outside the coop. If you can't use electricity, there are a few methods you can try. I like using rubber bowls, because if they freeze over, they will not crack! The ice will fall right out. Placing a few ping pong balls floating in the bowls will help the water to stay liquid longer. If you're home, you can break up the ice a few times a day in the waterers, but this is a pain. Beware of plastic waterers which can crack if they are frozen solid. In some breeds with larger combs or with roosters, frostbite is sometimes an issue. Frostbite occurs when condensation forms in the air and lands on the comb. The key here is to prevent the condensation from occurring. As all animals breathe, we output moisture into the air and the same is true of chickens. If there is not enough ventilation in the coop, the humidity in the coop will rise and the chance of frostbite occurring rises. You must find the right balance of ventilation and draft prevention. If frostbite shows up on one of your chickens, don't panic. If it's a tiny patch, it most likely needs no treatment at all. It will simple scab over, dry up and flake off. If it's over a larger area, you can place neosporin (without pain relief!) or vaseline on it daily. This helps to protect it from the cold and keep it moist as it heals. If you have large combed birds and are having colder than normal temperatures, you can smear a small amount of vaseline on the comb or wattles to protect them. Many chickens are less active in the winter due to the weather and frozen ground. The greenery and bugs they love to scratch through simply aren't there anymore. 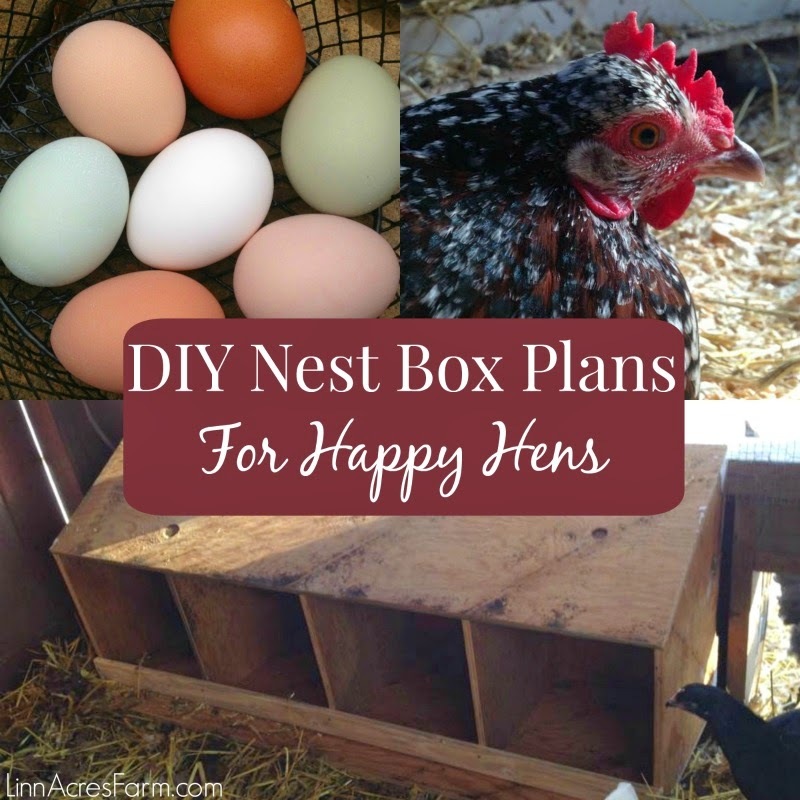 Make sure you give your chickens some boredom busters to prevent them from going stir crazy. A half of a pumpkin, a handful of scratch into a pile of leaves or straw, a head of cabbage, pieces of logs to climb on, or piles of straw/leaves to scratch through can help to keep them occupied! Our favorite thing to keep our chickens occupied is saving our fall leaves. We put them in a big pile behind the coops, and give them to the chickens as needed through the winter. 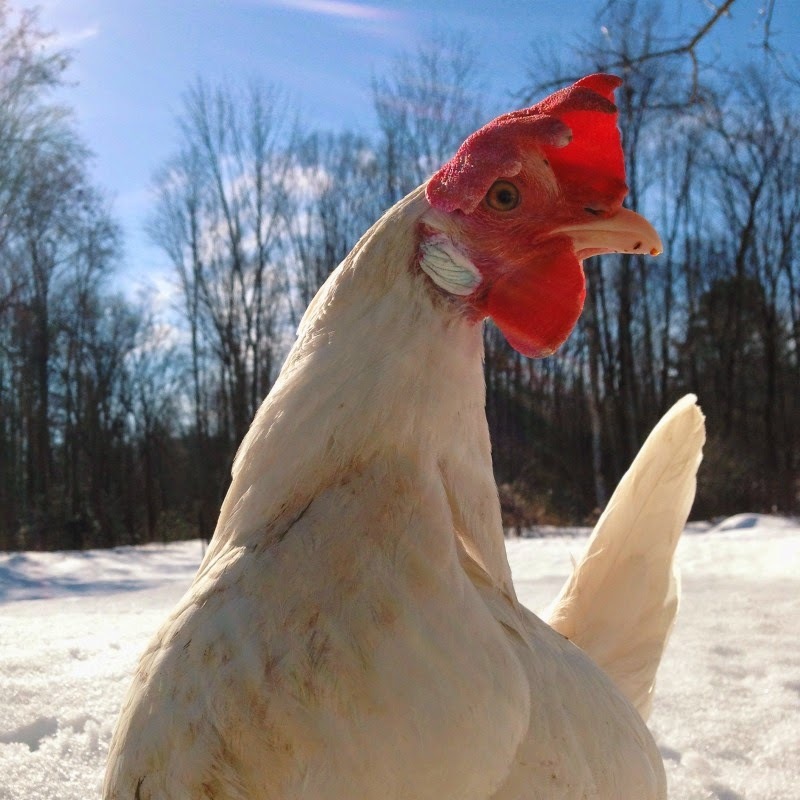 Do you have any winter chicken tips to share? Let us know in the comments! 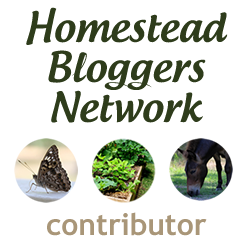 Shared on the Homestead Blog Hop, From the Farm Hop, and Simple Saturdays Blog Hop! I put three bales of straw in the (unheated) coop. The first bale, I cut the strings to it, but left it as-is otherwise. The girls had a ball tearing out the straw from the bale, scattering it all over the floor of the coop (which is what I was going to do, but they saved me the trouble!). Once they'd gotten the first bale scattered, I cut the string from the second bale. They're now in the process of tearing that bale apart. It keeps them incredibly busy, picking through the straw, finding bugs and seed heads, scattering it throughout the coop, plus it adds a layer of insulation to the floor of the coop. I'm doing deep litter method in there this winter, so they scratch up the straw once it's scattered. The final bale, I'll cut the string in the next month or two and let them have at it, but it doesn't stop them from trying to pick it apart now! I also got a cheap handheld mirror from the dollar store and hung it chicken eye level on a nail in the coop (but not so the sun would shine on it). They were fascinated with chicken in the mirror. I move it to different spots in the coop every now and then so they can see a "new" chicken. Really great advice and great photos. It doesn't snow here so I really enjoyed seeing your chickens in the snow. Have a great day! This is one thing I really wanted to learn about before getting chickens. This is great. Thanks for linking up on the Wednesday Homestead Blog Hop. Pinned and Tweeted. I hope to see you there again today. Nice post! 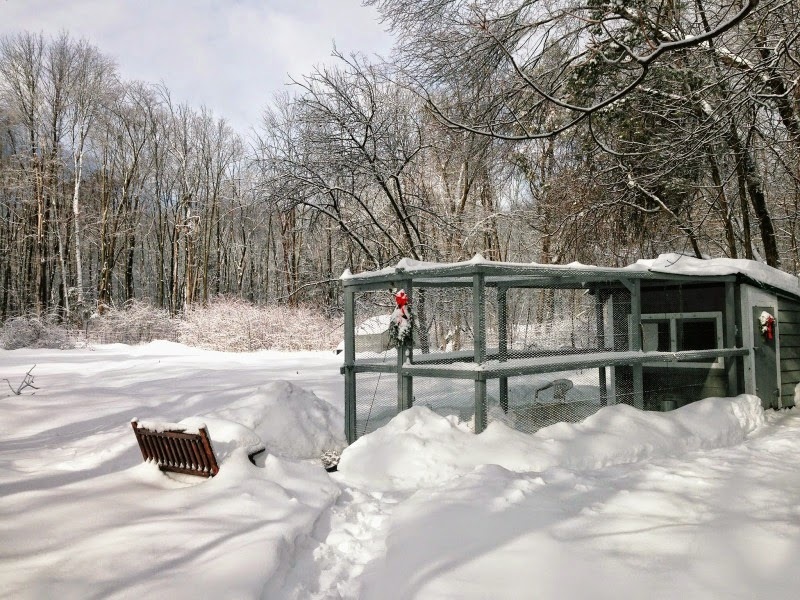 I recently posted on keeping chickens through the winter also. I agree, a few simple things done on our part, and they will be happy and healthy! We live in Ontario Canada where it can get pretty darn cold (-40 on occasion). The hens are in a fully enclosed, partially insulated coop (a section of a large barn that we made into a coop) I am worried about no heat at all, although I like the idea due to the costs involved in heating. Do you think straw, straw and more straw will do the trick for them? This is their first winter, so I'm trying to find any and all info I can.